Attending a new church can be a fascinating yet frightening experience for most people. For the most part, everything seems new and strange. Few things are familiar while most things are different. We understand those feelings when it comes to attending a new church. We’ve been there. We were new here once ourselves. You don’t know people’s names, you don’t know what classes we have, you even struggle to find the water fountain and the restrooms. No, it is never easy being new and it probably never will be. However, we want to help you make this time as easy as possible. When you arrive: Several parking spaces near the entrance are reserved for first time visitors. Please feel free to use one! Adult Worship: Our adult service is at 10:00 am and will last approximately 1 hour and 15 minutes. We worship together via singing for about 20 minutes. We have an open Communion that is offered to all believers each Sunday at ERCC, followed by an offering collection, but visitors are not expected or asked to put anything into the collection plate other than a card with as much information as you are willing to share about yourself (name, email address, prayer needs, etc). Our Senior Minister, Phillip Walton, will then share a message on a relevant life topic for about 30 minutes. Dress is generally casual, although a few will wear a tie and and a few women will wear a dress, but that is certainly not expected or even the norm. 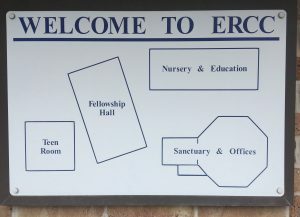 Nursery and Preschool Classes: ERCC prides itself in providing quality childcare and classes for children of all ages. Your child will be greeted by friendly and caring teachers who have all undergone training and criminal background checks. All teachers must be members of ERCC before they are permitted to work with our children. These classes meet in the education building adjacent to the auditorium building. Elementary Age Classes: During the 10:00 am worship service, all Kindergarten through Fifth grade children are together for Junior Church, a service designed just for them. Your kids will sing fun songs, make crafts and listen to an interesting Bible lesson that is taught on their level. The class meets in a large room in the Fellowship Hall. Click This Link to an Article Titled: What Kind of Church is This?